Last Thursday, a box arrived in our mailbox. Aubrey, who had tagged along with me to the mailbox, was visibly excited when she discovered keys to a package bin in our mail slot. "Mom! A package!! I wonder what it is?!" she exclaimed, bouncing with excitement as she poked the key into the lock and turned. I slid the box from the package bin. "Well, what is it??" she asked excitedly. "Dead frogs," I deadpanned. Aubrey was less-than-thrilled to receive such an odd package in the mail. I explained that we were going to dissect the frogs as part of our science lesson and she perked up a bit. She ran inside, yelling "Aiden! We're going to dissect frogs tomorrow!" I plopped the box on the counter and began sorting through the remainder of the mail, but soon found Aubrey at my elbow. "Mom, Aiden said we're going to cut up frogs and look inside them, but I told him that was gross and we would never do that. But he says I'm wrong. Are we going to cut up frogs?" she asked me, certain her brother was wrong. "Well, actually...we are going to dissect frogs. Dissect is a fancy term, but it means were going to cut open a frog and look at all of its organs and parts inside to learn about it. But the frogs are already dead, and all the blood has been taken out of them and they have been preserved in chemicals, so it isn't gross or yucky. It's just a way of learning about what living things look like on the inside." I tried to hide my amusement as looks of incredulity, disgust, and finally curiosity passed across her face. 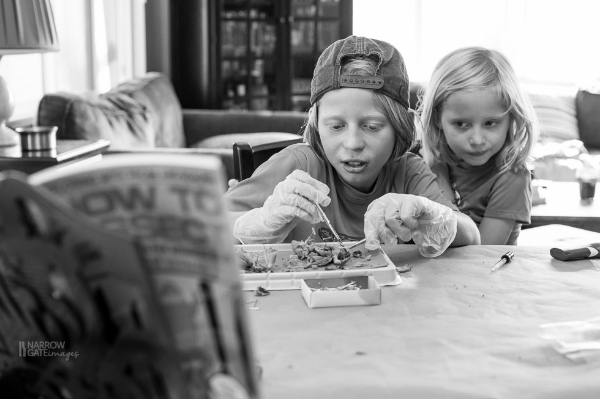 The following day, after concluding our lessons for the day, I spread butcher paper across the dining room table, brought out the dissection instruments, and gathered the kids around an empty tray. I ceremoniously plopped the cold and chemical-smelling frog onto the tray, and after donning gloves, we began to explore the external parts of the frog. My thinking was to ease the kids into the experience before jumping into the dissection, but they were antsy to wield the scalpel, so soon we were opening our dissection text and digging in. The kids took turns with the instruments, and were intrigued at first, but soon their curiosity turned to boredom, and after a thorough discussion of the internal anatomy, I turned the frog and instruments over to them to explore. Parts were disassembled. A leg was removed. It was quickly discovered that eyes were full of liquid that would squirt out when poked with the pins. The frog's tongue was stretched to its full length to see how it could capture bugs. The frog's lower intestines were opened to see its almost-poop. It wasn't a very precise dissection, but the children were fascinated and learning by observation, and their excitement and curiosity was contagious.